Mamma Mia! is canon of musical comedies, rocket-fueled by sheer thrum and pulse of toe-tapping, sing-along-tempting ABBA. It’s fun. Whether it’s Sophie’s impossible goal to bring together three men, any of whom could be her biological father — strangers Sam, Bill, and Harry — the idyllic Greek island setting, or any of the flamboyant supporting characters, this is a fun musical. And above all else, beyond its foibles, the Victoria College Drama Society’s (VCDS) production of Mamma Mia! was fun in turn. VCDS’ production, which ran from March 7­–9 at the Isabel Bader Theatre, was directed by Ronan Mallovy. On March 9, the theatre was packed with the usual audience composition of parents, friends, and theatre fans — likely jealous that they weren’t themselves members of the chorus. The audience’s tone was upbeat as the musical began slightly late, and there were occasional cheers and shouts as fan favourites and friends took to the stage. The production was largely carried by a few standout performances. Lisean Henry brought a palpable vibrancy and momentum to her performance as Donna, Sophie’s fiercely independent mother and former lover of her three potential fathers. Alexandra Palma as the seductive, vain, and reliably lively Tanya had an unmistakable energy and stage presence that proved a nice foil to the performances of Lisean Henry and Elizabeth So, who played Donna’s other friend Rosie. Gianni Sallese, a familiar face in campus theatre, played one of Sophie’s potential fathers, Sam Carmichael. His recognizable physical presence and movement, as well as natural humour, was on full display. Kody McCann (Bill Anderson) and Leo Morgenstern (Harry Bright) were also excellent additions to the named cast. The chemistry between the three fathers was amusing and they maintained high energy throughout their time on stage. Special mention must also go to Carter Holmes as Pepper, staff member at the small hotel Donna owns. He brought a spring and comedy to the stage that managed to stitch together the scenes we all wished would hurry up a bit until the next big number. The music direction, led by Emma Wallace, kept the tempo of the show moving along at pace and brought a swollen sound in all the right places for the big numbers. The tight proximity of the band to the actors on stage, at a close stage left, added to the casual tone of the performance generally. However, while the set design was on theme and the fly-set window panes and plants were a nice touch, the cast’s interaction with the set pieces was lacking overall. When they did interact heavily with the set, there was a sense of clumping and some issues with voice projection in the conversational elements of the musical. In the more dramatic scenes, there was little interaction with the set at all, and the space taken up by the set could have been better used by the well-choreographed cast. In addition, perhaps to the end of showcasing the admittedly solid vocal talents of the leading cast, the fact that some of the greatest tunes of the musical, namely “Mamma Mia” and “Dancing Queen,” were performed by a small ensemble was a real and regrettable shame. Whenever the cast and chorus at large were on stage as one, the energy in the room was tangible and electric. When they were absent, there was a real question of how there could be so little energy on stage with so many people waiting in the wings undoubtedly wishing they could join in. The performance largely underused the cast and chorus for the big vocal performances. While the leading cast were impressive, songs like “Mamma Mia” and “Dancing Queen” are meant to be belted aloud and put the crowd under a spell. Instead, the energy in these teasingly low-tempo performances fell starkly flat. The best part of Mamma Mia! was the end — and this isn’t meant in a snarky, holier-than-thou critical sense. The finale of the show is well-known: a full-ensemble performance of the biggest show tunes to, usually, a standing ovation, as was the case on March 9. The end felt like the very first time the energy level in the room was absolutely cranking, and songs like “Mamma Mia” and “Dancing Queen” had me mouthing the lyrics, whereas their performances during the core show had me somewhat distracted. All in all, it would be a good wager that most, if not all, of the audience left Mamma Mia! having had fun. And beyond careful and persnickety critiques, if that isn’t a worthwhile goal of campus theatre, then what is? For the final play of its 100th season, the Victoria College Drama Society (VCDS) chose a production of Twelfth Night, Or What You Will. The show runs for two and a half hours, with a 15 minute intermission. Notably, the same show was first put up by VCDS a century ago, with an all-female cast. “We re-mount it to celebrate our past and to look to our future as we continue to grow,” Executive Producers Alyssa DiBattista and Leora Nash wrote in their producers’ note. During their introductory statements, DiBattista and Nash also pointed out how appropriately coincidental it was for opening night to fall on International Women’s Day. Directed by Maya Wong, VCDS’ Twelfth Night is aesthetically cohesive, thanks to the clean and naturalistic set designed by Wong and Artistic Designer Abby Palmer. Often, student productions use similar ‘classic’ sets that are meant to be timeless. It was refreshing to see VCDS use wooden furniture, IKEA chairs, and even plants to create a modern stage. The plot of Twelfth Night revolves around Viola (Kashi Syal), who falls in love with Orsino (James Hyett), who is in love with Olivia (Jasmine Cabanilla), who mistakes Viola for a man and falls in love with her. Madness, of course, ensues. Ironically, the chemistry between Syal and Cabanilla is palpable, perhaps more so than either of their chemistries with Hyett. Admittedly, the show’s modern context is a bit confusing, as the hierarchal relationships between the characters are never fully explained. The blocking of the play also falls lacklustre at times, with multiple actors simply standing in a line during certain scenes. However, Cabanilla sparks laughter every time she used her cell phone as a prop, and Wong creatively modernizes the traditional Shakespearean sword fights written into the play, with choreography by Jade Elliott McRae. Maria (Nicole Bell) and Sir Toby (Jacob Levitt) are especially strong characters, thanks to Bell and Levitt’s performances. The two deliver their lines with such ease that the audience can clearly understand Shakespeare’s jokes. The scene with Maria, Sir Toby, Sir Andrew (Braden Kenny), and Fabian (Maher Sinno) tricking Malvolio (Ryan Falconer) is particularly delightful to watch. An original score composed by Music Director and Composer Sam Clark and Assistant Composer Wilfred Moeschter also makes this classic love triangle story unique. With the harmonizing voices of Percy Thomas and Yasmine Shelton, the musical interludes are gorgeous. Overall, Twelfth Night is an aesthetically pleasing production featuring strong actors and a uniquely creative production team. For the love of VCDS, do not miss the end of this historic season. Twelfth Night, Or What You Will will run at Isabel Bader Theatre until March 10. Disclosure: Kashi Syal is The Varsity‘s Associate Arts & Culture Editor. Sometime between October 31, 2017 and November 10, 2017, $800 in cash went missing from the Victoria College Drama Society (VCDS) cash box, located in a locked office. According to the society, eight members of VCDS have access to the office, located within the larger Victoria University Students’ Administrative Council (VUSAC) office, as do housekeeping staff and the VUSAC president. VCDS believes the money was stolen. While cleaning their office during the fall reading week, VCDS co-producers Alyssa DiBattista and Leora Nash discovered the empty cash box, but they originally thought nothing of it. “We assumed that our Chief Financial Officer, George Wilson, must have deposited the revenue from our first show into our bank account. Later in the month (before our second show), however, George went to count the amount in the money box, to be used as a float for our second show, only to find that there was only the small amount I had seen during reading week,” wrote DiBattista. Wilson wrote that much of the money allegedly stolen had been “inherited by past years executives who often kept cash from shows in the office,” assuming the cash was revenue from past shows. Most of that money was deposited into VCDS’ bank account, but the money in the cashbox at the time of the supposed robbery was kept as float for the VCDS production of Colours in the Storm, which ran in mid-October of last year. The $800 consisted of the float cash and one night’s revenue from the show. The incident has resulted in the VCDS employing stricter policies regarding how it handles its cash. “While there have always been official policies on money handling and counting, there had never really been anything specifically addressing money in the locked VCDS office,” said Wilson. According to Wilson, the new policy is that no cash will be left unattended in the VCDS office, and the drama society will now be using VUSAC’s safe or VCDS’ own bank account whenever possible. Additionally, non-VCDS members will not be allowed in the office outside of normal hours, and keyholders will only be allowed to enter the office for VCDS purposes. “Our fall production of The Drowsy Chaperone occurred under these new policies without incident, and we believe the policies will continue to succeed,” said Wilson. DiBattista claimed that there was a history of stolen money within the VUSAC office. “However, this was the first time money was stolen from inside a private, locked office at VUSAC and it was also the largest amount of money stolen, so we felt the need to respond thoroughly. We feel extremely disappointed because the purpose of having an office for our organization is to have a safe and useful space, but that’s been compromised, and it feels violating,” wrote DiBattista. The co-producers brought up the matter at a VUSAC meeting but were advised that there could not be an investigation. They were asked to consider more secure methods for storing funds that must remain in the office for short periods of time. As to why there was no investigation, VUSAC President Zahavah Kay said, “Ultimately it was decided that the best and most practical solution was to improve security moving forward. VUSAC has supported this decision by recommending all levies purchase safes for their offices, limit key sharing, and keep the office locked at all times.” VUSAC itself has also increased security by decreasing the number of office keys distributed, as well as limiting after-hours access to the office. As of press time, there is no update to the identity of a perpetrator, and Campus Police have not been informed of the alleged theft. Correction (January 8): a previous version of this article incorrectly stated that only eight people have access to the VCDS office, and that the cash box was locked. In fact, the cash box does not have a lock, and eight members of VCDS, as well as the VUSAC president and housekeeping staff, have access to the office. The Victoria College Drama Society’s (VCDS) recent production of The Drowsy Chaperone was absolutely incredible. The show was written by Bob Martin and Don McKellar in 1998 as a parody of musical productions from the 1920s, and it featured music by Lisa Lambert and Greg Morrison. Directed by Meredith Shedden, the production combined the magic of a bygone era with comedy, singing, dancing, romance, danger, satire, and blindfolded rollerblading antics. The play’s events took place on the day of the wedding between star personality Janet and her fiancé, George. The central premise of the show was keeping the groom from seeing his bride, and this is where the cast of quirky characters play their part. The set transformed from a 1990s living room to a glamorous 1920s wedding mid-show; it continued to switch back and forth throughout the play, pulling the audience in and out of the fantasy created by the narrator, Tom Fraser, who pulled the show together with his witty commentary. The set’s French doors opened and immediately engulfed viewers in a magical time. The detailed costumes were particularly notable, full of lace frills, elaborate wedding dresses, luscious velvets and furs, coats and tails, and sequins. Drowsy‘s incredible cast pulled off iconic numbers, like “Show Off,” wonderfully. Ryan Falconer was perfectly sleazy in the role of Aldolpho the ‘Latin lover,’ with his self-titled solo, “I am Aldolpho,” drawing rowdy laughter and applause. Arin Klein and Jamie Fiuza were excellent as a gangsters-turned-pastry chefs vaudeville duo, and Lucinda Qu was a show-stopper with a wonderful vocal performance as Trix. Best of all, Olivia Thornton-Nickerson, who played Drowsy herself, was truly a star. She was funny and glamorous, showing off her incredible voice and stage presence in an enchanting red velvet ballgown. Her rendition of “As We Stumble Along” was hilarious and awe-inspiring. Drowsy was a complete pleasure to watch, and it transported the audience into a world more glamorous and more musical than their own. Cast of Rent. Courtesy VCDS. In its final production of the year, the Victoria College Drama Society took on a staple of the Broadway canon. 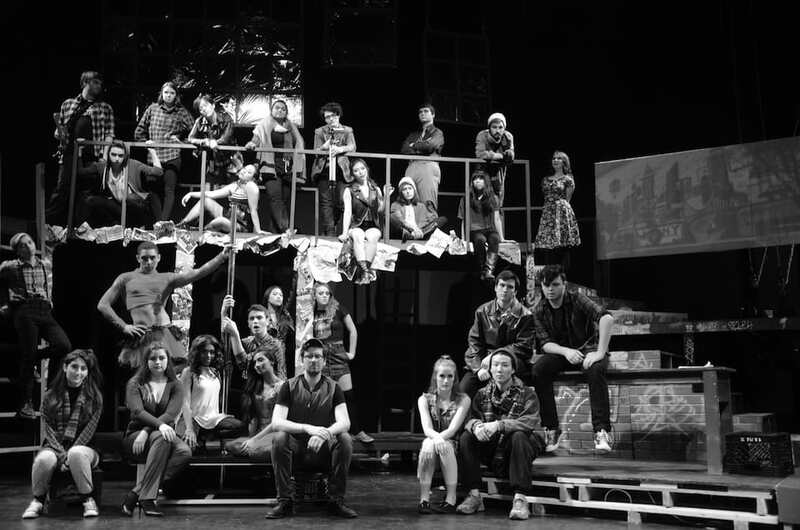 Jonathan Larson’s Rent is a rock musical that has found its place in history as the quintessential depiction of bohemian life in late-1980’s Manhattan. The action focuses on roommates Mark (Katie Pereira) and Roger (Michael Henley), and their neighbour Mimi (Mirabella Sundar Singh), who takes a liking to Roger. The guys are in conflict with their ex-roommate and now-landlord Benny (Winston Sullivan), who found wealth through marriage and abandoned his bohemian lifestyle. Benny demands that his former friends help him to suppress a rally planned by Mark’s recent ex-girlfriend, Maureen (Nithya Garg), against the clearing of a lot occupied by homeless New Yorkers in exchange for forgiveness of their rent. With the help of her current girlfriend Joanne (Hannah Lazare), and recent couple Collins (Roddy Rodriguez) and Angel (Aaron Hale), Maureen’s rally continues, causing Mark and Roger to be locked out of their building. A series of conflicts ensue, as the group struggles with poverty, HIV diagnoses, drug addiction, and encroaching injustices brought on by consumerism and intolerance of their gender and sexual identities. The production unfolded on an unassuming yet appropriate set. Adorned with graffiti and distinctly unkempt, the stage evoked a sense of New York City non-conformity. The pop-art computer projections behind the stage were hard to miss, as they often obscured the actors’ faces. Director and choreographer Shak Haq succeeded in lending a politically charged, slightly anxious energy to the production. Media clippings from the time that the musical was first staged added authenticity and political weight to the plot. The greatest strengths of Haq’s direction and choreography revealed themselves in large group numbers. The intimate physicality by the company in “Contact” pulled on all the viewers’ senses. “La Vie Boheme” and “Rent” also profited from a passionate sense of solidarity and a fearlessness of the slightly obscene. The show lost energy at moments of transition where it relied too heavily on blackouts, and cast members frequently exited and entered the stage with no apparent motivation. The show could have used many more technical runs to iron out glitches; Henley’s microphone was dysfunctional for the first act, and lighting queues often lagged, compromising the pace of what should be an energetic show. Garg delivered a standout performance as Maureen. She portrayed the rash, self-absorbed siren convincingly, while never failing to delight listeners with her polished, energetic singing. The questionable blocking of “Take Me or Leave Me,” which involved an office chair and a stripper’s pole, was saved by the superior singing of both Garg and Lazare. Sundar Singh’s Mimi found her stride in the second act, where her coy charm and vocal talent captivated the audience as well as Henley’s character. Hale stole the show with his dance performance in “Today 4 U,” while he and Rodriguez brought chemistry to the stage early on in “I’ll cover you.” Despite microphone problems, Henley delivered a consistent performance as Roger. Pereira’s acting as Mark shone, and they tied the production together nicely with thoughtful, well-executed monologues.